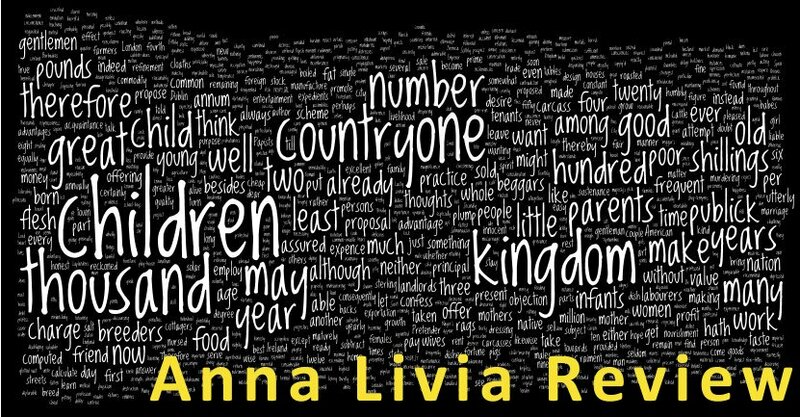 Anna Livia Review: Highly Recommended: Sunday 30th, June, 2013. 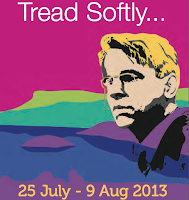 A Celebration of WB Yeats: the second Tread Softly... festival, Sligo. 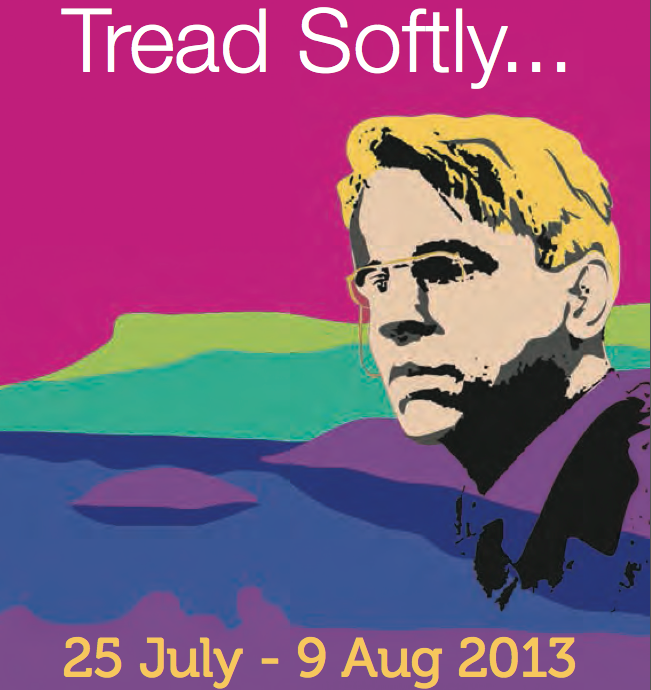 Tread Softly… is a festival bringing the story of Sligo’s greatest artistic family to life with two weeks of Music, Theatre, Exhibitions and the Spoken Word. Sligo is the spiritual home of the Yeats family. The Nobel Prize-winning poet, William Butler Yeats and his brother, the artist Jack B., and their sisters, the embroiderer, Susan and fine press printer, Elizabeth have a life history inextricably linked to Sligo. W. B. Yeats is considered by many to be the greatest English language poet of the 20th Century. Throughout his life he wrote about Sligo and the beauty, folklore and spirituality of the surrounding landscape. His brother Jack once said he never created a painting “without at least a thought of Sligo in it”. Tread Softly... is an initiative of Blue Raincoat Theatre, Hawk’s Well Theatre, The Model, Sligo Live and Yeats International Summer School supported by Fáilte Ireland and is produced by Sligo Yeats Partnership: Michael Carty, Meg Harper, Niall Henry, Paul Keyes, Emer McGarry, Marie O’Byrne and Rory O’Connor. Follow the link to the programme for more details. The Gezi Park protests, started as an act of peaceful resistance to save the hundred year old trees at Gezi Park – the final green public space at the heart of Istanbul – have turned into a widespread Youth movement and have inspired millions of citizens in Turkey to stand up for their rights and freedoms which are being suppressed by the system and the people in power. Since May 31st, millions of activists, artists, academicians, students, civil society actors and citizens are marching in the streets of Turkey to save GeziPark, to challenge the status quo, which is ignoring the rights of humanity and the enviroment, and to voice their democratic demands. 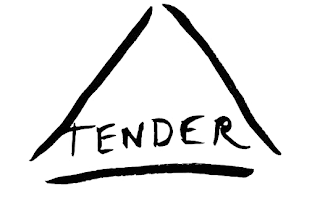 This event is in conjunction with "100 Thousand Poets For Change"
Issue 1 of tender journal (edited by Rachael Allen & Sophie Collins), is launched in The Galley Café on Saturday the 29th of June at 7.30pm. Tender was established in April 2013 as a platform for work by female-identified writers and artists. The journal is published four times a year as a carefully curated pdf. An annual anthology of favourite pieces from throughout the year will follow in print. "This anthology celebrates the Russian translator along with the Russian poet. 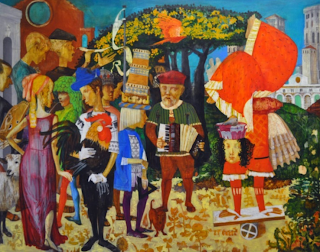 All the work herein is translated from the Russian originals, with a few exceptions for "English-as-a-Second-Language" poems from noted bilinguals Philip Nikolayev (who provided many of the translations in this volume), Katia Kapovich, Irina Mashinski, and Andrey Gritsman (who also provided translations); there is also one English-language poem from Alexandr Skidan. Except where noted, all of this work is seen in English for the first time. In the interests of accuracy and inclusion of as many poets as possible, I have decided not to provide the Russian text of the poems. This omission will be rectified in a future and expanded print version of this anthology." If the anthology above has sparked an interest in Russian poetry, then the Russian Poetry in Translation page is one to keep in touch with. I found this introduction to the Origins of Russian Poetry, written by Philip Nikolayev, to be a great starting point. Prashant Keshavmurthy asks whether Russian poetry is founded on a particular creation myth. You see, Prashant, Russian poetry is different from the Indian, Persian and Arabic poetic traditions in that it is new. Though it arguably has its "myths," it does not go back to a myth. Apart from liturgical verse, the first Russian lyric poems on record, anonymous, are from the early 17th century. They are fine texts of the courtly boyar culture, and they have survived in a mansucript exported from Moscow c. 1620 by Richard James, an Englishman. I have studied these poems in detail. In Russian scholarship, due to the influence of Marxist ideology, they have been traditionally discussed as "folk poetry," but there is no doubt in my mind that they are works by a poet of the courtly class, a boyar. They present a view from within the Kremlin. Among them, incidentally, is the first Russian metrical poem (just one at this time!). But the first outstanding Russian poems, from the 18th century, are by Mikhail Lomonosov (1711-1765). Notice that I am a skeptic about the so-called Lay of Igor's campaign, a poetic narrative that allegedly dates from the 12th century; I looked into it closely at one point and am of the school that considers it to be an 18th-century forgery. Russian literature is unquestionably ("typologically," as the word goes) a Western literature, and that includes our poetry, although the steppes of our south, the swamps and woods of our east and the permafrosty tundras of our north all contribute their tones and colors. Mikhail Lomonosov's greatness lies in large measure in the fact that he, being possessed of a fine ear, took Western ideas of meter and applied them in an inventive and organic way to the Russian language, making meter work for Russian and thus forever defining standard Russian verse as accentual-syllabic (syllabotonic). The original models for verse used by certain lesser and earlier Russian poets came from Poland were syllabic in nature (syllable count without fixed accentual patterns); they that original syllabic verse sounds quaint and remote today (although I should also note Alexei Tsvetkov's interesting and robust experiments toward reviving the possibilities of Polsih-like syllabic verse in Russian). Lomonosov's influence is felt in poetry to this day. His greatest poem (I'll translate it sometime) is "And Ode Selected from Job," a verse translation of a part of the book of Job from the Old Testament, where, on having heard Job's plaint, God speaks to him out of the cloud. The recent book title -- "Behold the Behemoth" -- by Oleg Dozmorov, a major current poet, alludes to a line in that great ode of Lomonosov's, confirming our bond with and our debt to him. Various poets followed Lomonsov, and the greatest among those was Gavriil (or Gavrila, i.e. Gabriel) Derzhavin. And then in the early 19th century we had our greatest poet, Alexander Pushkin, his brilliant life and early tragic death, and that is the central, defining event and "mythos" of our poetry. In a way, he is to our poetry what Mozart is to Western classical music. Such are the origins of Russian poetry. August 01 - 05, 2013. Fermoy, Co Cork is getting ready for this gathering of poets from far and wide who come to share their poetry on open mic sessions, workshops and the ever popular 'Poetry Bus'. Come and enjoy readings from international and Irish published poets. Also attend book launches from a number of new and up and coming poets from Ireland and abroad. 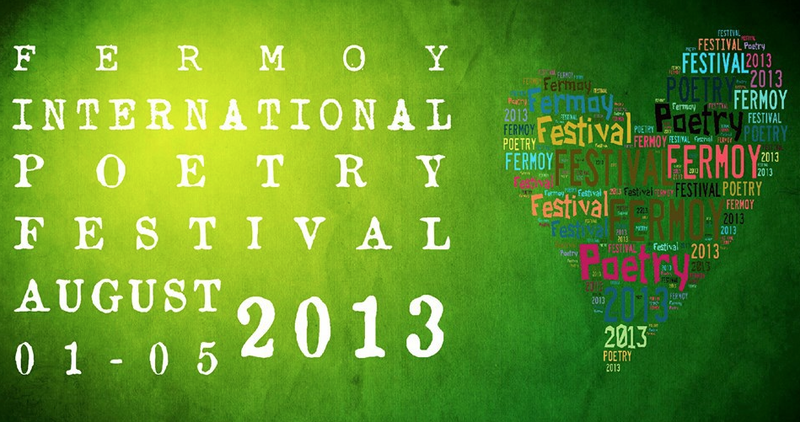 The winners of the National and the International Poetry Competitions will read their work at the festival. The competition judge is poet Noel King. Hello Anna, am wanting to contact you about poet Melissa Green's new memoir, which I'm about to publish, and whether you might be interested in reading and/or reviewing it. Sorry for the delay in replying. Holidays! Delighted to hear you're publishing Melissa Green's memoir; please do send it to us. We'd be very keen to review it. Ann & Seamus at Anna Livia Review. Interesting read some other articles about Abbey Theatre. Who was Yeats inspired by. Didn't know about the Nobel Prize in 1923. It seems like his most famous poem was Second Coming. Are there others that are more well known. Hi Bob. Thanks for your comment; sorry for the delay in replying - holidays! Yeats is a fascinating poet and playwright. As well as exploring the inner workings of his heart he led a very active public life. A great deal of his work responds to what was going on politically in Ireland. Some of his best-known poems: The Wild Swans at Coole, The Lake Isle of Innisfree, A Prayer for my Daughter and Sailing to Byzantium. Other favourites include: Easter 1916, September 1913, No Second Troy, Long-legged Fly, The Circus Animals' Desertion, Among School Children, Broken Dreams and Politics.